Certificate and Diploma Recipients | Technology Training, Inc.
Jacob Biederman of Stoneridge, Lexington, Ohio, received his Dynamic Test Specialist diploma in 2015. Jacob is now pursuing the Data Acquisition and Analysis Specialist (DAAS) diploma. Jacob's DTS thesis outlined the testing completed on a new potential customers vehicle and how that data was utilized to change the design of the part to allow the part the best opportunity to survive in the application. The methods used to collect the data, analyze the data and transform the data into a laboratory test were all skills learned from TTi classes. The test setup involved a unique adaptation to the design for vibration and fixture class that was taught and actually utilizes a fixture that resonates at certain frequencies to get the desired amplitude during testing. Cody Norton of HALDEX BRAKE PRODUCTS CORPORATION, Kansas City, Missouri received his Dynamic Test Specialist diploma in 2013. Cody's thesis was titled "Gathering Reliable Vibration Data." Martin L. Klein of the US Navy, Crane, Indiana earned his Environmental Engineering Specialist Diploma in 2012. His thesis was titled “Hazard Assessment of 120 mm Cartridges. 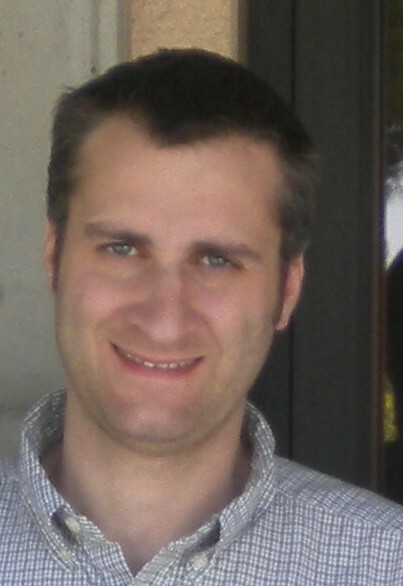 Anthony DePaolantonio of TRAX Services (ECIII) at the United States Army Proving Ground, Yuma, Arizona was awarded his Instrumentation Specialist Diploma in 2010. His thesis topic was "Comparative Analysis between the Omega OS-136 and the Omega TJ36-ICIN for surface temperature measurement." 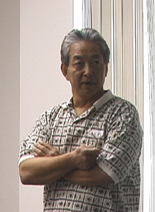 Stan Endo (retired from Northrop Grumman Missile Systems in Clearfield, Utah) was awarded his Dynamic Test Specialist Diploma in 2010. His thesis topic involved the evaluation and comparison of a dynamic test procedure used on equipment moved from one physical location to another. 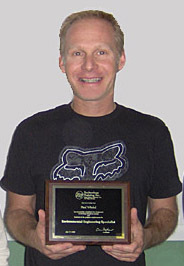 Paul J. Winkel of the NAVAL AIR WARFARE Center in China Lake, California, earned his Environmental Engineering Specialist Certificate in 2008. He is working on additional diplomas, specifically Climatic Test Specialist and Dynamic Test Specialist. According to Paul's supervisor, Joel Huddleston, "The work that Paul accomplished as Project Manager on the ESAD (Electronic Safe and Arm Device) testing system was in direct response to the Navy’s need for an operational device to meet the requirements that at the time were not met. Utilizing the Navy’s Capital Investment programs funding, he was able to expand NAWCWDs Research, Development Testing and Evaluation capability to test current and future ESAD/Fuzing systems." 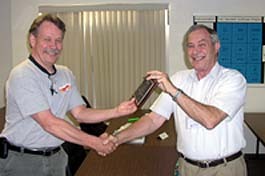 TTI President Colin Stephens presents a Dynamic Test Specialist Diploma to Domingos Strafacci Domingos Strafacci of Centro Tecnico Aeroespacial, Instituto de Aeronautical e Espaço, Brazil, earned his Dynamic Test Specialist Diploma in 2006. Domingos’s thesis was an excellent description of his work on a dynamic test project in which he was personally involved to qualify the First Stage Booster Adapter for the VSB-30 Sounding Rocket’s first flight. Jay Merithew (formerly of Nokia Mobile Phones in Irving, Texas) earned his Dynamic Test Specialist Certificate in 2005. Jay's thesis, which was excellent and was accepted without revision, deals with a dynamic test project in which he was personally involved. The corporate test specification for vibration testing on mobile phones was increased from 500 Hz to 1000 Hz. Jay performed preliminary calculations and tests to determine whether or not their existing test setup could meet the requirements of the new specifications. It was discovered that the equipment could not meet the specifications, so Jay did some more investigations and discovered that the problem could best be solved by redesigning the fixture. A new fixture was designed and fabricated and further tests indicated that the new specifications could now be met. As Jay writes, "The whole process of becoming certified has helped me in numerous ways to understand not only the principles of vibration technology but the best and most correct way of running tests, building fixtures and understanding test procedures and specifications." Leslie Landon, Engineering Manager in the Hardware Validation Lab and Jay's supervisor, writes, "Jay has developed all of the testing and equipment procedures for our vibration system. He has trained team members and assisted internal partners from around the globe. Jay's coursework from TTi and his practical hands-on experience have resulted in our capabilities to test Nokia products according to our global and regional requirements."